Clean and healthy drinking and cooking water. The SPA filter cleans hot water! Everybody knows that water contains chlorine in order to avoid the spread of microorganisms, which can cause epidemics. Chlorine and the bad quality of water supply can worsen the quality of drinking water. This is the reason why many people do not drink running water. Therefore, we need to clean the water in our kitchen. 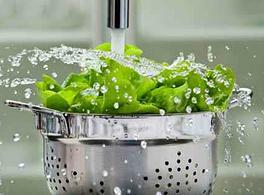 Just imagine cleaning fresh and healthy salad before consuming, with water that is full of chlorine, bacteria, or lead or mercury. Coffee and tea have a totally different taste when we make them with clean water. You do not need to buy more mineral water; by using Filter Capsules, you get clean and filtered water. We can make our food and drinks with clean water.